The College is making some changes to the timetable with the aim of further supporting student progress. These changes will be introduced in three phases. Phase 1: This will affect Year 13 students from 16 April onwards. Afternoon lessons are being restructured to allow for greater intervention time in the build-up to examinations. Standard teaching time will run from 1.15 – 3.30pm, with a 15-minute break in the middle. The final half hour will be set aside for individualised study. For some students, this may mean independent study or revision, but for most it will involve compulsory workshops with teachers to maximise their progress. All students will be expected to remain available until 4.00pm should their teachers deem their attendance at these workshops as necessary for their development. Please note, some departments may be in a position to implement this new timetable from as early as 12 March. 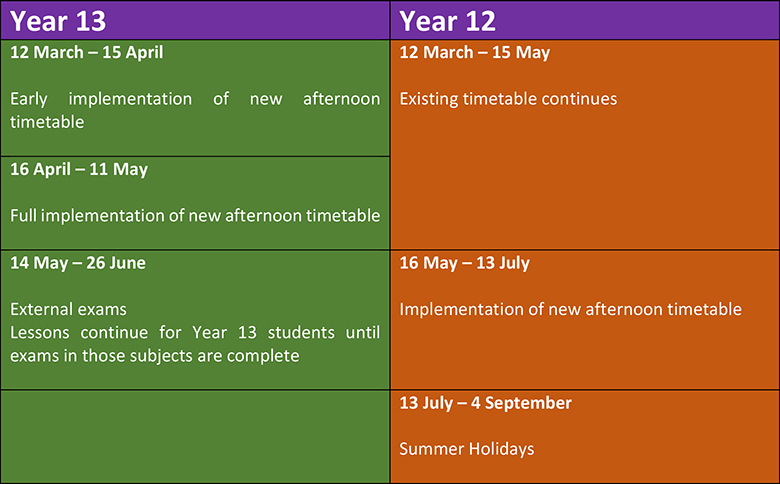 Phase 2: This new structure to afternoon lessons will come into force for Year 12 students from 16 May (following the completion of Year 12 examinations). The results from these internal exams will help teachers to identify which students would benefit most from these interventions. Phase 3: An entirely new timetable will be put into place for September 2018. Senior management are currently consulting with teachers on the best structure for this timetable and students will shortly be invited to input into this consultation as well. The outcome of this consultation will be fed back to students and parents, when a decision has been made. The reason these changes are being implemented is to raise standards overall and to narrow the achievement gaps. We recognise that while some students have embraced the independent study model very effectively, there are others who would benefit from greater intervention. Support for all students from their teachers remains a priority and we believe these changes will help all students to maximise their potential. These changes are following on from recent developments regarding communication with parents. We recently implemented a policy that parents would be alerted by email to all student absences (where we have email addresses for parents). We would like to remind all parents that they can get access to a lot of information about their son/daughter’s progress via our information portal Tyber. Further information about this and how to access it is available in the Parent Zone.